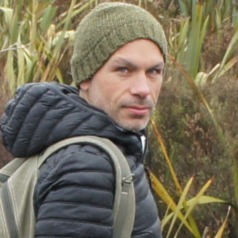 Pierre-Henri Blard is a geochronologist and paleoclimatologist with a CNRS research position at the Centre de recherches pétrographiques et géochimiques, Nancy (France). He shares his research time between CRPG Nancy and the Laboratoire de Glaciologie of ULB Bruxelles. His main expertise is to develop and apply geochronological tools to reconstruct past climates. He is notably a specialist of in situ cosmogenic nuclides (3He, 10Be, 26Al, 21Ne), used to place constraints on the fluctuations of Ice Sheets and mountain glaciers, from time scales ranging from Pleistocene (> 1 Ma) to Holocene. P.-H. Blard also works on the links between climate and erosion in montaneous areas. * Scientific head of the Noble Gas Lab of CRPG Nancy. * Member of the scientific committee of the CNRS LEFE-IMAGO program devoted to research in climate and and paleoclimate. * Teaching Geochemistry, Paleoclimate and field work at the Ecole Nationale Supérieure de Geologie (Nancy). * Involved in several ANR and international projects.